Versioning provides a historic record of changes. By linking versioning with the wall-clock / business times (i.e. bi-temporal) views of the system at previous points in time can be recomponsed. This is important for providing consistent views over your data. However simply adding versions to your objects (more precisely your object key) has the downside that you can no longer look up the value via it’s business key: you must know the business key as well as the version of the object that you want. In Coherence accessing objects via their key directly is far more performant than doing a query (see The Fallacy of Linear Scalability) so it is preferable to keep the latest version of the object available via its business key alone. There are two common approaches to solving this problem: The Latest/Versioned pattern and the Latest Version Marker pattern. Writes must be directed at the ‘Latest’ cache and a Coherence Trigger is used to copy the object reference to the ‘Versioned’ cache adding the version onto the key as it does so. This is demonstrated in the first figure opposite. The disadvantage of this approach is a memory inefficiency arising because the latest object exists in both Latest and Versioned caches. 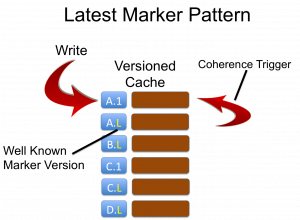 When the object is written the same reference can be used to save space, however the backup copies in each cache will be different instances and, should a node be lost, and process of recreating the primary from the backup copy will create new instances by default further eating memory. It is therefore advisable to use the LatestMarker pattern below when memory is a concern. The advantage of this approach is that it reduces the number of records in the latest caches which makes filter operations faster when they operate only on ‘Latest’ data (a common use case in most applications). 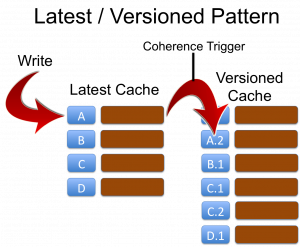 Define two cache schemes based on the masks Latest* and Versioned* ensuring that they are in the same CacheService. In the Latest* scheme specify a trigger to forward objects to the versioned cache, incrementing the version as it does so. Specify KeyAssociation (Affinity) on the business key of the Latest* cache across both caches. Write a trigger that adds a monotomically incrementing version to the business key as it copies the value’s reference to the Versioned cache. You’ll need to use direct backing map access to avoid reentrancy problems (I’ve discussed the issues of reentrancy in Coherence before. See Merging Data And Processing: Why it doesn’t “just work”). The code sample below is provided for reference. This approach does not suffer from the issues of duplication associated with separate Latest and Versioned caches but has the disadvantage that versioned data is in the same cache as latest data, marginally slowing down filters. Just reiterating that again: in this pattern there is only one copy of the latest object. The one with the latest marker. This is different to the latest/versioned pattern where the latest object will exist in both caches (so twice) so that the versioned cache can contain all versions of that object. Create a cache with a KeyAssociation on the business key (i.e. the key parts without the version number). Add a trigger that replaces the current value for the “LatestMarker” with the new object whilst copying the old value to a key with the appropriate real version. You’ll need to use direct backing map access to avoid reentrancy problems (I’ve discussed the issues of reentrancy in Coherence before [link]). See code sample below. The below code outlines one mechanism for moving objects (in this case for the Latest/Versioned pattern) from one cache to the other using direct backing map access. If you are using Latest-Marker it’s essentially the same but with a marker key. Latest/Versioned or Latest-Marker – which to choose? Both patterns are good. We have use both extensively in my current project. Latest marker is probably best overall due to the aforementioned storage issues with Latest-Versioned. However if you are likely to make most use of the ‘Latest’ view, and will be scanning without the use of indexes, Latest-Versioned can offer performance benefits. It also feels simpler when you use it, as from the outside things are what they are. These patterns are really important to use. They form the basis for many of the more advanced use cases. You need one of these to do MVCC, Snapshotting etc. Note that affinity (Key Association) must be used to ensure that the versioning process is entirely local to the JVM doing the write. Check out Andy Coates’ neat way for doing it here. One of the main reasons for implementing these patterns is to allow more advanced features of MVCC and Snapshotting. MVCC is a concurrency control mechanism which is based on your objects being versioned. It is useful where two clients mutated the same version of the object and you want one to get a failure (and one write to succeed). This is very simple to implement in Coherence by including the object version in the write and have a trigger ensure that the version of the object being updated equals on the in the cache, otherwise exception. Snapshotting is a more complex topic because it requires time so I’ve covered in a separate post here. Your version map seems like a per-key queue of fixed size. How do you purge old versions beyond, say 3 revisions/versions? Do you do a findMaxVersion(key) and findMinVersion(key), then if max > min + 3, then remove(key + min)? That looks like a lot of queries. Hi Ashwin. It’s actually just a Map. Versions can be expired based on time, size or some custom policy. Accidently, I’m working on exactly same problem right now. And I can suggest 3rd aproach – using special kind of indexing structure (via Coherence index API) to find right version of data. Thanks Alexey. That is a very useful post. I have a post about snapshotting and timestamping in the pipeline and your method will be very relevant to that so I will incorporate it there. – It is faster and more scalable (as it is directed rather than hitting each node). Although this problem can be partially addressed with PartitionFilters. – It allows you to use near caching – something not available to filters. As I said though – for time based queries which I’ll be posting on and discussing at the SIG your approach looks ace. D) get (local unless partition redistribution happens before this point) – return that as the result of your invocable. All depends on the cost of a single invocation, and making sure no pointless deser/ser goes on. Advantages would be: no second copy, no need to do a trigger that causes double the backup traffic/ events, immutable versions (ie near cacheable with no invalidation), should easily scale to get all, and pretty much zero overhead for as-of versioning ( the invocable can know what the highest version acceptable is) if you do clocked/non-local versions in the keys. Underhood, helper will create TimeSeriesFilter wrapped into KeyAssociationFilter. KeyAssociationFilter will ensure requiest to be send to key owner only. This is almost as efficient and cache.get(). Add the numbers ( 2 + 11 ) and SUBTRACT two ?